Course participants work out counters against Kick-Boxers according to some standardized routines. Will they be able to apply these counters in free sparring or real fighting which does not follow any pre-arranged routines? Of course, they will if their combat training is systematic and methodological. Working with routines saves a lot of time. When we are familiar with the routines, we must progress to other stages of combat training where controls are gradually released so that eventually we can free spar. The participants here are advanced practitioners who already have gone through the other combat training stages. Hence, the attack and defence exchanges here are quite free right at the start. Chris poses as a Kick-Boxer and attacks Sifu Anthony with the first routine. Sifu Anthony intercepts the first kick and the second punch, and counter-strikes with a palm. Here the Kick-Boxer could not complete his planned routine of attack. Chris uses the second Kick-Boxing routine. He starts with two jabs, followed with two thrust kicks. Sifu Anthony dodges the two jabs and strikes the leg as the Kick-Boxer kicks. The size of the video clip is 1.98 mb. Nick now poses as a Kick-Boxer employing the planned third routine. Sifu Anthony intercepts the three attacks and counters with “Green Dragon Shoots Pearl”. The tactic here is to let the opponent attacks, then counter-strikes after closing him. Charles posing as a Kick-Boxer attacks Nick with the first routine. But Nick intercepts and counters with a series of strikes, giving Charles no chance to complete his planned routine. This is “tak sai pat yew yen”, which is exploiting an initial advantage and not allowing an opponent to escape. Charles plans to implement two jabs and two thrust kicks, which is the second Kick-Boxing routine. Nick brushes of the two jabs and deflect the first kick. Then he counters with a series of strikes, giving the Kick-Boxer no chance to continue his planned attack. Grandmaster Wong suggests that Nick should fell the Kick-Boxer as it is easy to do so after he has kicked. If you decide to use the tactic of felling a Kick-Boxer immediately after he has kicked, and you have trained this counter well, technically speaking there no chance for a Kick-Boxer to recover. It is because the timing is such that by the time he manages to place his leg down, you would have felled him. In reality, he may recover if he is very skilful. Here Nick uses a high-level counter. Nick tempts Charles to attack. After brushing off the initial attacks, Nick kicks at Charles groin as Charles kicks. Again, technically speaking, a Kick-Boxer in this case would have no chance to escape from Nick's kick. 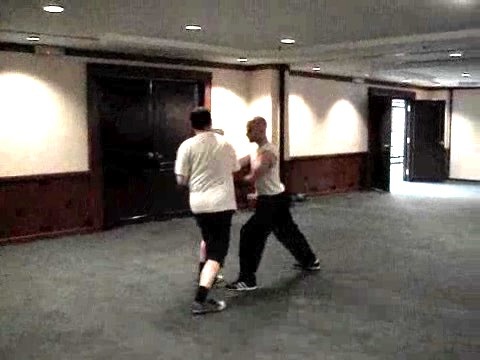 Some Effective Counters against Kick-Boxing Attacks from Wong Kiew Kit on Vimeo.